Today’s Friday Photo is actually two photos. So I’m cheating. But I couldn’t choose between these two. Snackbox is Chef Mark Noguchi’s latest way to feed the Honolulu food-obsessives who crave his eats. While he oversees the tiny eatery (it’s literally a counter inside the super-cool PAD Hawaii home décor store in Kaka‘ako), it’s Chef Kimmy Oi who does the day-to-day magic. I am shocked and astonished that I would love a photo of kale so much, but I do. 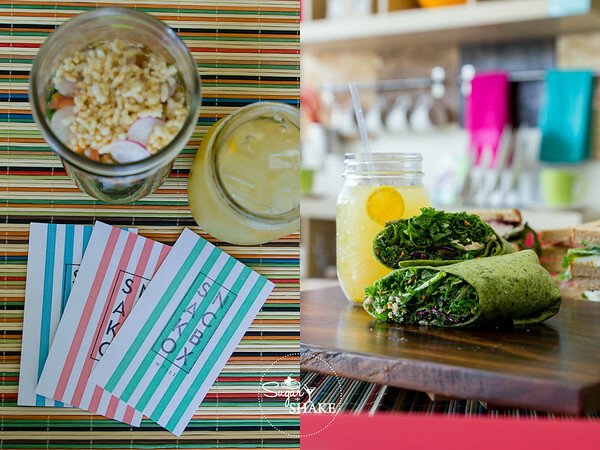 This (on the right) was a kale wrap (which was pretty tasty, considering it’s kale—yeah, that’s a train I’m just not on) and a glass of Snackbox’s delicious olena (turmeric) lemonade. On the left, we have an adorable Salad Jar (local greens packed into a mason jar—isn’t everything, these days?—topped with puff rice) and the same lemonade. The kale was exceptionally pretty, though taste-wise I was more into the other sandwiches we sampled (Egg Salad, BLT and Turkey Cranberry). Snackbox also offers an especially delicious version of Vietnamese iced coffee (also in a mason jar) with housemade condensed coconut milk. I had two. Plus, I had a ginormous coffee earlier that morning, so I was a total crazy person by the end of the day. I have not been that highly caffeinated since college. I just wish Snackbox were within walking distance of my office because I *LOVE* good sandwiches and downtown is pretty much a sandwich desert.